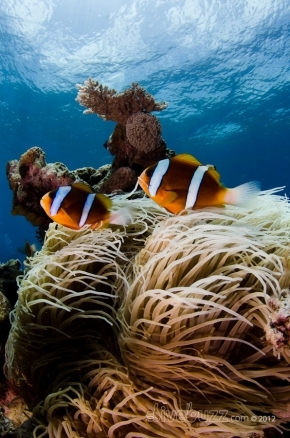 Cairns is, without doubt, the gateway to the Great Barrier Reef. Any visitor, whether aware of this fact or not, will quickly work this out after just a short stroll through the streets of this tropical city. Booking agent after booking agent exhibits floor to ceiling brochures on reef day trips, liveaboard dive trips, introductory diving, snorkelling, Scubadoo, reef walking, glass bottomed boats and semi submersible tours to name just a few! There is literally something for everyone and divers are spoilt for choice. If time is a limiting factor, or perhaps you are travelling with non-divers, a day trip is perhaps the best answer for you. 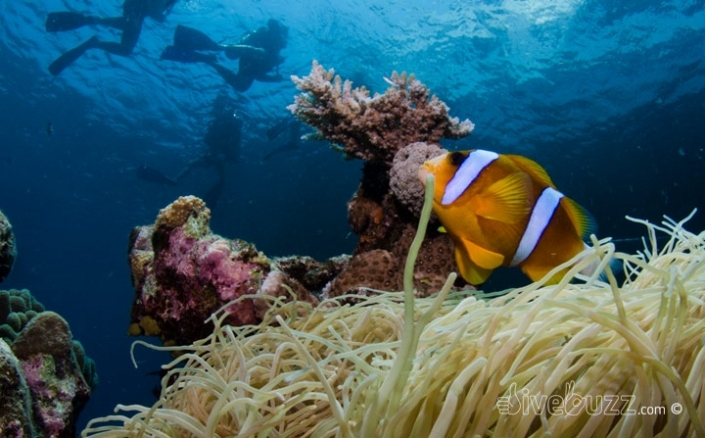 There are a number of operators that run day trips to the reef for both divers and snorkellers from both Cairns and its up-market neighbour, Port Douglas. With all this choice, where do you start in your quest to discover the best Great Barrier Reef has to offer in a day? Thankfully, DiveBuzz have the local knowledge and experience to get you well on your way to selecting a day trip that will be tailored to your needs, experience and budget. The following questions are a great starting point in what you will need to consider prior to parting with your hard earned cash. Tropical Cairns itself is built on mud flats around Trinity Inlet and is surrounded by lush rainforest steeped mountains and rich agricultural land, predominantly cane fields. So what is the relevance of this I hear you ask? Well, dredging of the inlet, agricultural run-off and other human factors means that the water clarity close to Cairns can often be low. Visibility, particularly after rainfall, is not what the brochures would lead you to believe and dive location is therefore key. Generally speaking, the further away from land you travel, the better the visibility, so find out where your potential operator visits. 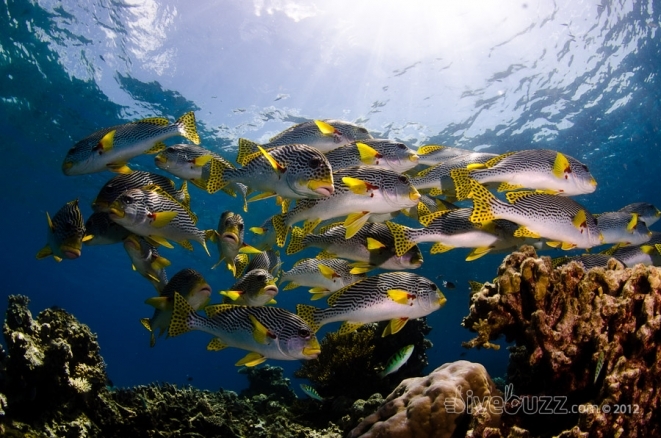 With operators that visit the outer reefs you are more likely to have improved visibility. That is not to say that the dive sites closer to Cairns are not worth visiting as there are some fantastic reefs such as Thetford and Michaelmas Cay that sit closer to shore, but visibility will almost certainly be less. Certainly something to bear in mind. Being located in the tropics, Cairns offers year round diving with water temperatures ranging from around 23°C in the dry season (winter months from June to Aug) up to 29°C in wet season (summer months from Dec to Feb). Despite year round diving, conditions do vary significantly on a seasonal and on a daily basis. Wind is probably a key factor to consider on your day trip and 25 knots is not uncommon, especially during the dry season months from June to August. For those of you that are prone to seasickness, 25 knots is rock and roll for your trip to the reef! Once moored up, the reef offers protection, so generally, sea sickness will be limited to the trip out and back. Seasick tablets are your friend, as long as you plan ahead. The wet season obviously has a higher chance of rain, but more often than not, it can be raining in Cairns, due to it’s surrounding hills, and not out on the reef. The wet season also coincides with ‘stinger season’, when there are noticeably more jellyfish in the water. The term stinger season is actually quite misleading, even though there are greater numbers of jellyfish during these months, the vast majority are completely harmless, so do not panic if you see jellyfish in the water. There are two main types of dangerous jellyfish in the GBR. The Box Jellyfish is coastal dwelling and is very rarely seen out on the reef. They breed in estuaries and live their life on the shoreline, therefore you are very unlikely to see one. The Irukandji jellyfish is also predominantly a coastal dweller but is occasionally found on the reef. It is a small jellyfish, with a bell measuring only 1cm across and tentacles from 10cm to much longer. There are other jellyfish that can cause stinging or tingling sensations, but the vast majority of the time, by the time you get back on the dive boat, you will have forgotten all about it. As a general rule, if they don’t have tentacles, they don’t tend to sting. Divers are rarely troubled by jellyfish but there is still a small risk of being stung and for this reason, full body coverage is usually recommended during stinger season. Due to the abundance of nutrients in the water during this time of year, the water can appear to have more of a green hue than other times of the year. However, visibility can change on a daily basis, and is affected by many other factors. Aside from seasonal differences, the reef always looks better with some sun and calm waters from both above and underwater. Calm waters mean less water movement and therefore better light penetration, allowing the sun to bring out the true colours of the reef. If you have a few days in Cairns and do not need to visit the reef on a set day, keep a close eye on the conditions. The Bureau of Meteorology website (www.bom.gov.au) is an excellent resource for checking marine conditions and many of the booking agents in Cairns will also show wind and weather forecasts for the coming days. 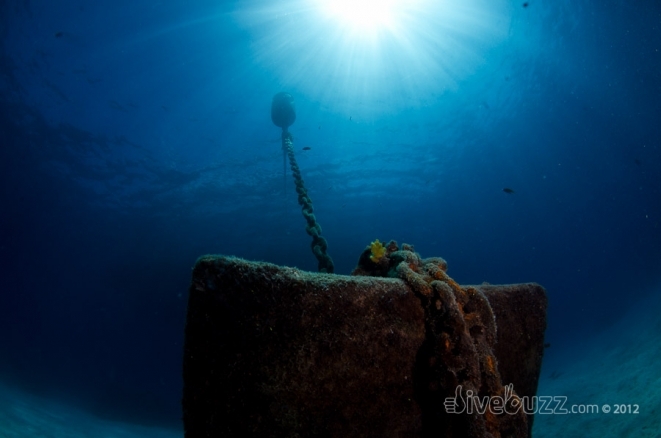 With careful planning, you should be able to secure the best diving conditions for your trip. With conditions varying on a daily basis, a good question to ask is also how many potential reefs and dive sites does the operator have access to. Marine Parks have a number of public moorings on the Great Barrier Reef and, in addition, each operator will own and maintain its own moorings. Obviously, the more reefs and dive sites an operator can offer the better as it means that there should always be a suitable site to visit according to conditions. Definitely check out the small print in terms of what is included and excluded from the price of the trip. Prices do vary between operators but you will need to make sure that you are comparing like with like. Often, the “cheaper” operators do not work out any cheaper than the higher end operators once you add on the exclusions. Potential extras on top of the advertised price may include reef tax (collected on behalf of Marine Parks), fuel levy, gear hire, lycra suit (stinger suit) rental, dive guides, morning tea and snacks, photos taken by the operators onboard photo pro, introductory dives, additional dives, hotel pick ups and drop-offs and so on. A good way of calculating value for money and cost of the trip is to calculate all of the estimated costs and then divide it by the number of dives to get a per dive rate for the trip. Some operators insist on divers going guided, others charge extra for guided dives so you will not only need to consider the potential additional cost of having a guide but also whether you are comfortable in diving without a guide on unfamiliar sites. 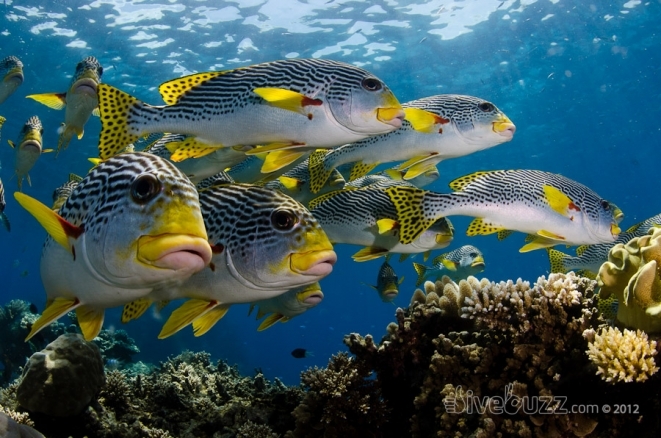 If you are an experienced diver or underwater photographer, you may prefer to go unguided to avoid the crowds and allow you to go at your own pace, so you will need to ensure that this is possible. However, for most divers, an experienced guide will no doubt enhance your experience – after all, they dive the reef everyday, so know the sites well, and will point out the local marine life, including Nemo and Wally, the friendly Maori Wrasse. Being guided also means you can relax in the knowledge that they will ensure you return to the boat without the need for a long surface swim. Ask how many dives the operator offers. Some will offer 1, 2 or 3 dives on the day trips so worth bearing in mind, particularly if you are assessing value for money. 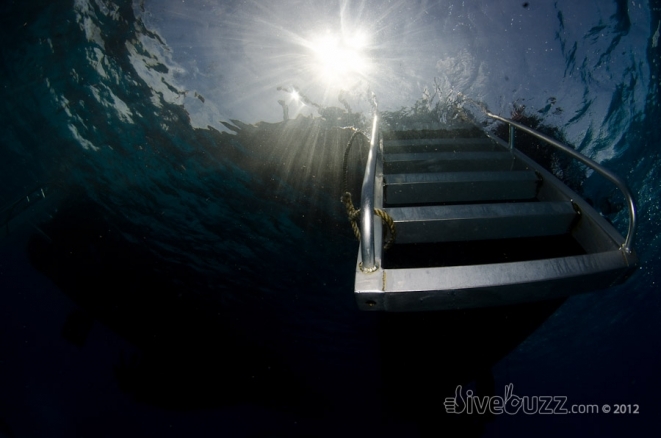 If you are anything like us at DiveBuzz, you will want to get as many dives into your day as possible! Once you have decided how many dives you would like to do, ask how many sites the boat will visit in a day. Some of the operators that offer 3 dives, only visit 1 or 2 locations, meaning that you will have to dive again at the same location, although this isn’t always a bad thing and gives you the opportunity to explore a different area. Other operators will offer 3 dives at 3 different locations, which obviously maximises your chances of seeing different critters. Also worth asking if there is any limit on length of dive time, this is key if you plan to do 3 dives in a day as some operators will limit your dive time to allow you to fit 3 dives in, meaning that it may be better to do 2 longer dives, or choose a different operator whose schedule allows more time out at the reef. Queensland is, without doubt, one of the safest places in the world to dive, with all operators forced by law to strictly adhere to the Queensland Code of Practice for diving and snorkelling. This means that safety standards are world class and gear is well maintained and serviced. If you do not have your own gear, this is comforting to know. For those large males out there with feet so large that you hardly need fins, you’ll need to ask if the operator can accommodate your foot size for fins. Operators do provide a range of sizes in rental equipment, but for those of you with feet outside of the normal range, you’ll need to check. Also worth asking what fins the operator has. Because of the warm waters, most operators offer full foot fins, if your foot size or shape do not lend themselves to full foot fins you can find operators that offer open heal options. Better still, invest in your own to ensure your comfort! With all the fresh air and exercise you’ll be getting on your day trip, you will certainly work up an appetite. Operators generally offer buffet style lunch included in the price, however quality does vary. Some operators offer hot and cold options and a good selection to choose from, whilst others will be more limited. Also, some operators will include morning tea, light breakfast options on boarding and afternoon cakes, fruit or cheese platters for your home-bound journey. For other operators none of this may be included. So again another item to consider. 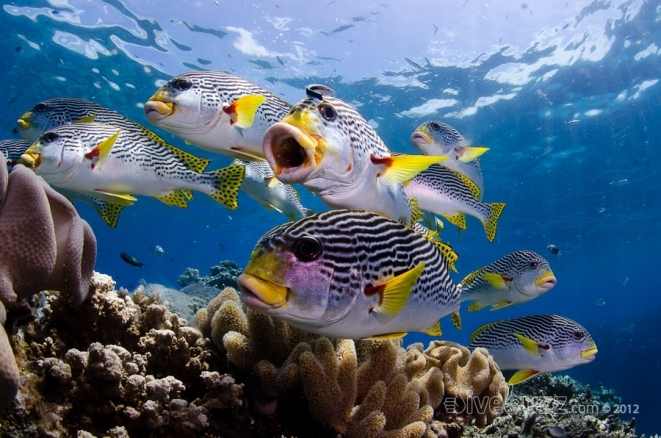 At DiveBuzz, we always try and select the best operators and trips for our diving. That is not just by luck or chance, it is because we fully research our options to allow us to select the best, tailored to our needs and experience. 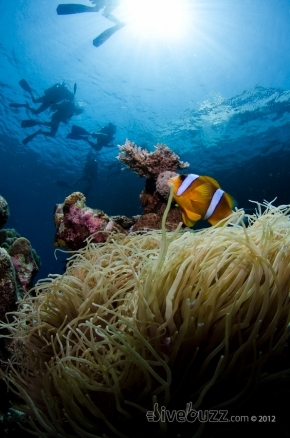 There is plenty of world class diving out of Cairns, you just need to do your research. So armed with this knowledge, you can now ask the right questions to make a more informed choice about planning the best day trip out to the reef for you. So what are you waiting for? Dive in, experience tropical Far North Cairns and some of the best of the Great Barrier Reef in just one day. Get the buzz, get the day boat DiveBuzz! Can you tell me if any boats do a day trip that goes out farther than the poor visibility you mentioned above? I’ve heard most go out two hours. It doesn’t sound like that is really far enough. Hi Laura, you can indeed get good visibility on day trips out of Cairns and 2 hours on a fast boat does take you out far enough. You should target operators that say that they go to the “outer reef” which means that they visit reefs furthest from land. We recommend Silversonic as a great day boat out of Cairns – they visit 3 different dive sites in a day. Also good is T6 (3 dives, 2 different sites). Hi, do you think the diversity of marine life and less damaged corals are found around the Thetford area, or more toward Michelmas or Upolu? I’m an experienced snorkeler that will be taking my first dives out of Cairns, and was debating between tours with Silverswift, Ocean Freedom, and T6, so any help is much appreciated! Thanks! Hi Meredith, Silverswift usually visit Flynn, Milln and Pellowe reefs, which are great. T6 varies between the same reefs and Saxon/Norman and both are great boats. Silverswift always visits three different sites in a day. We don’t have any first hand experience of Ocean Freedom.